The worst part of traveling, to me at least, is the packing. Now I will probably get in trouble for saying this, but, the stress of packing comes from my wife. Wendy is very methodical and has the tendency to over-think things. While at home I very much appreciate her efficiency and she keeps our home running smoothly at all times. Packing however throws her into a panic because of her fear of the unknown I guess. She packs by the “what if” method. What if we need…what if we run out of…what if…and the list goes on. You see the suitcases and such in the picture I took? We have been packing now for two weeks and we don’t leave until October 18th! So I have learned over the years to let Wendy do her thing, and I toss something into the pile when I think of it. 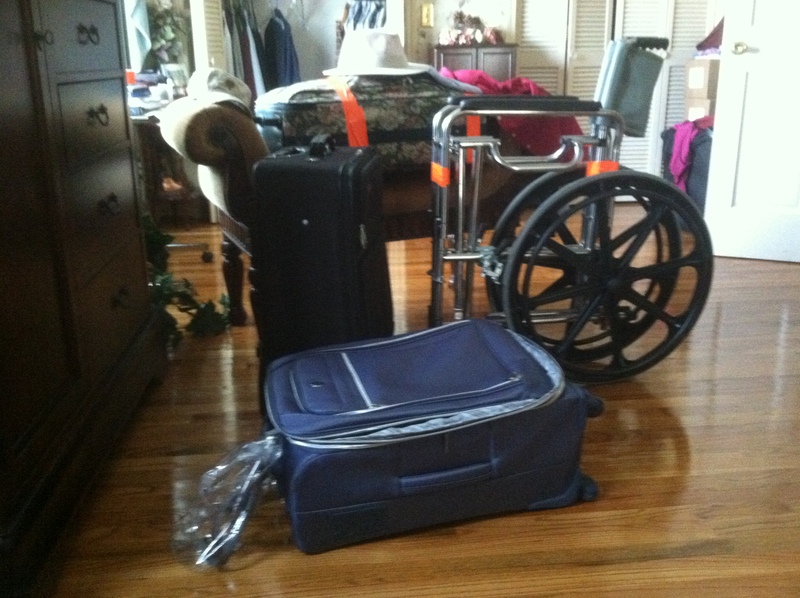 Since my injury, I now have to pack a lot of extra medical supplies that I never had to deal with in the past. If I should forget to bring the right amount of underwear with me, I’m not overly concerned. I can make due. But if I forget to bring certain necessary medical supplies, then I have a problem that is difficult to deal with overseas. Medical supply businesses can be readily found in the USA, but overseas might be a different story. As a remedy for me forgetting anything, I have a list and can keep a bag packed at all times. Sort of like a mobility bag in the military. Always packed and ready to grab as I roll out the door. IMPORTANT: One nice thing to mention here about packing for disabled people is to put all of your medical supplies into one suitcase. There are no baggage charges for medical supplies as long as those are the only things in the bag. That is a very nice savings. Another thing that we do is to mark all of our things so that they are easily recognized when we are getting our luggage. In our case I use fluorescent duck tape on everything. Many people have taken to doing this so you may want to come up with your own creative idea for marking your luggage. Like most people, I have my favorite clothes that I tend to wear the most. I have my clothes bag packed with all my favorites, and this week I get to explore things hanging in the back of my closet or tucked away in the bottom of my dresser drawers that rarely see the light of day. I also just leave a suitcase open, and as the days progress, I toss in things I think of as I roll by. My style of packing can really annoy Wendy because we think quite differently. But after 29 years of wedded bliss, we just let each other do our own thing in order to maintain the bliss part of wedded. My last piece of advice here for disabled travelers is to allow PLENTY of time at the airport. The last thing I need is to be rushed and stressed out at the airport. So arrive early, check in early, get frisked early and relax at your terminal while you “people watch.” Who knows, you may even see me watching you! You have your passport and your destination in mind–now you need to find a reliable tour company that is familiar with accessible travel. In my case, I have done my travels through a group that hosts numerous tours. The group is extremely detail oriented and works directly with the travel agency, so I have complete confidence that the standard travel arrangements will be faultless. 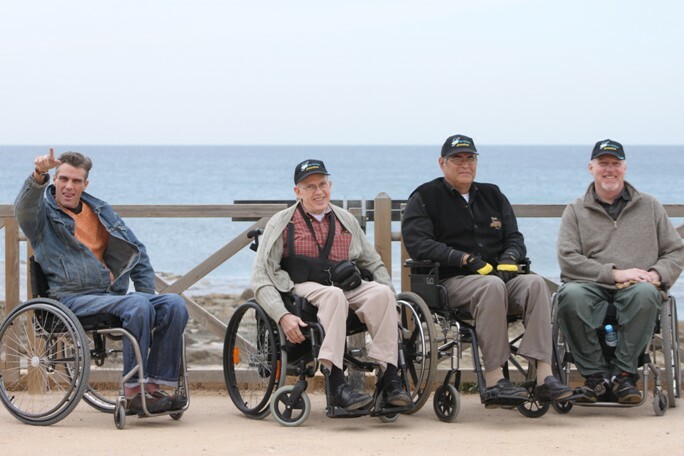 With that being said, when I helped coordinate the accessible tour to Israel two years ago, I stayed very involved in the details since this was the first trip of its kind for this particular group. But after much planning and many meetings, the accessible piece of the pie went very smoothly. I highly recommend getting connected with a tour group that promotes accessible travel, or with a group that is willing to listen and work with the many issues that a disabled traveler has to consider. For instance, if my flight has a layover, has enough time been allowed to get to my connecting flight? If I land in Concourse A, and my connecting flight is in Concourse D, I am going to need more time than the average bear to catch my next flight. I’m sure you have seen people running through the airport to catch connecting flights. Or people getting zipped across the airport in golf carts (which are not wheelchair accessible). Smaller airports are usually not a problem, but some of the larger airports I have to take a subway train from one concourse to the next. And what if I need a restroom break between flights? All of this takes extra time for me. So make sure the travel agency plans accordingly. Parking at the airport is also something to look into. Some airports offer free or reduced rate parking for disabled people. Allow me to add a note of personal experience here. I contacted an airport once and asked about parking, getting a confirmation that parking was free for disabled individuals. The one thing they forgot to mention is that there was a time restriction of five days. We were there for six days and had to pay the full price. Live and learn. And then there are the seat assignments on each flight to consider. You need to call in advance to confirm an appropriate seat that is not in an emergency exit and one that is accessible for a transfer. Be very specific in your request when asking about seats. Each plane is designed differently and the reservations people need to know and understand what you need. For instance, I found out (also the hard way), that the arm lift on the aisle seats raise up out of the way, allowing for a transfer, on only one side of some plane models. I was given a seat where the armrest did not raise up, so I had to throw my body up and over the armrest to get into my seat. Not the most graceful thing I have ever done. So be sure to ask reservations what model plane you are flying on and to have them place you on the correct side of the plane. If the customer service person you are talking to does not know, then ask for one that does. All of these questions can be asked politely, but they do need to be asked. Hotel arrangements at your final destination need to be checked and rechecked. 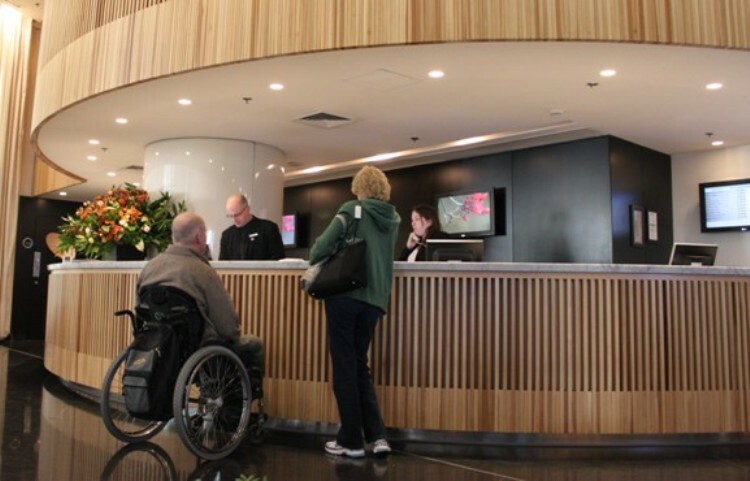 Just because a hotel claims to have an accessible room for you, does not make it so. A blue handicap sign on the door with a grab bar in the bathroom does not make it wheelchair accessible. I have actually requested reservations to measure door widths and available space in the room and bathroom to maneuver my wheelchair around. The tour company I use is familiar with what I need and is very good at making sure it will work for me. Last but not least is ground transportation at your vacation spot/spots. I called three weeks ahead once for a car rental with hand controls. You guessed it. The wrong size car was waiting for us with no hand controls. Car rentals can be very tiresome. 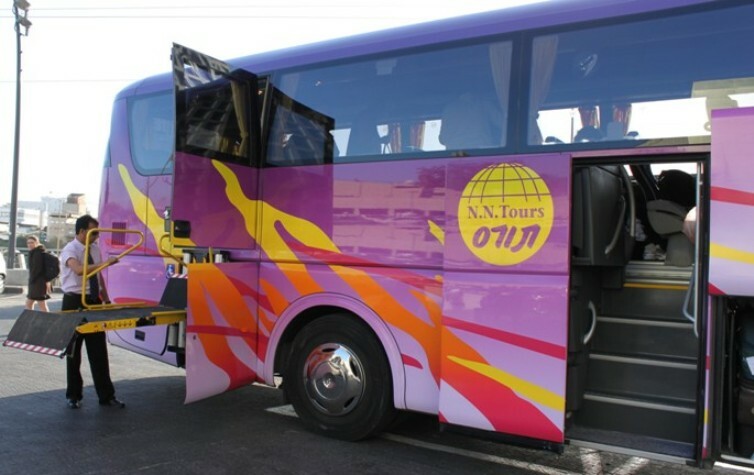 On the trip I made to Israel, we had a tour bus with a wheelchair lift which was wonderful. On our upcoming cruise, we will be making many port calls and the tour buses will not have wheelchair lifts. So a car and driver has been assigned to our group especially for me. I can easily transfer into and out of the car, and follow the rest of the group around on the bus. Yes there is an added expense to do this, but the money will be well spent to make our vacation an enjoyable one. Once again, the tour company I use has done the bulk of what I talked about. But I still keep my finger on the pulse of everything. It is much better to deal with everything on the phone before we leave, than to get to Europe and find out there are problems that for a disabled traveler can quickly turn into a fiasco. This blog is very different from my usual posts about the daily aspects of living with a disability. I will be back on topic starting Saturday. I will be taking all of you along with me on a Mediterranean cruise! So consider this post a narrative interlude between living at home with a disability, and traveling with a disability. But in the meantime, I’m sure that many of you do not know that I have recently had a book published. 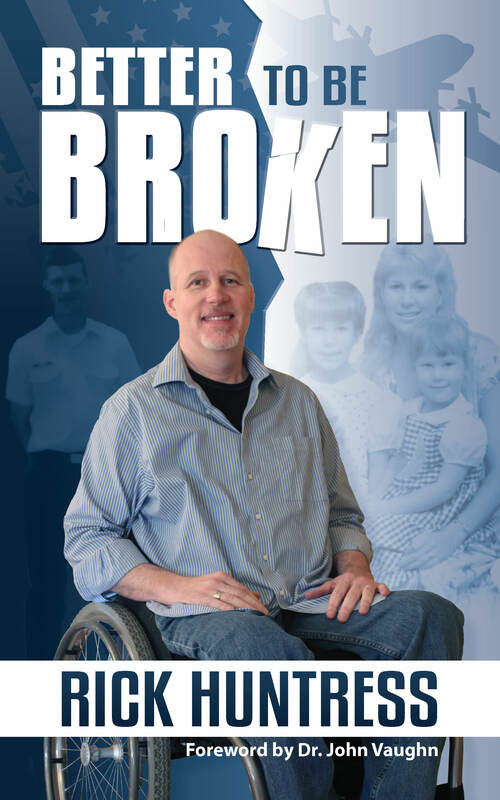 The name of the book is “Better to Be Broken.” Not only is it a journaling of my injury and the journey that has brought me to where I am now, it is also a very transparent look at Rick Huntress as a man. Yes my body is now broken, but there is also a spiritual brokenness that my book talks about. Both are important and both are good. You did not read that wrong. I said “both” are good. So if you, or someone you know, could use some encouragement and hope in life, now is your chance to find that hope in my book “Better to Be Broken for absolutely FREE! But remember only for the next two days, October 2 and October 3. So don’t miss out–download your free copy today!